May Summer’s Best Looking Eats Win! | Hupy and Abraham, S.C.
May Summer’s Best Looking Eats Win! Do you consider yourself a grill MASTER or a tailgate chef extraordinaire? Does your Instagram put the Food Network’s Instagram to shame? 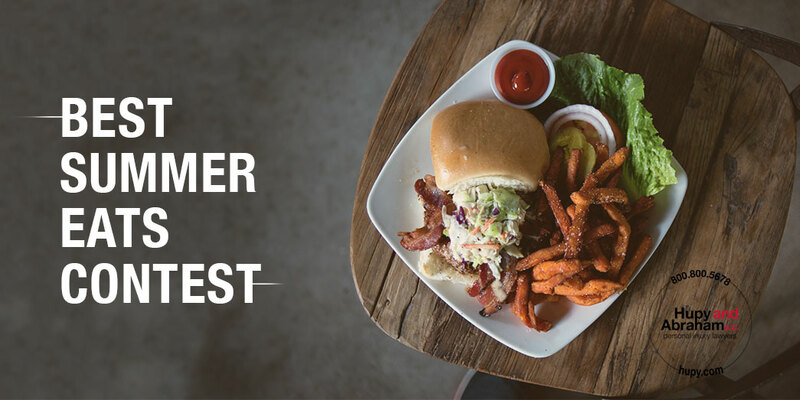 If so, the Hupy and Abraham “Best Summer Eats” photo contest was made for you! All you have to do is snap a photo, if you already haven’t, of your ultimate summer masterpiece and submit it to win! Visit the Hupy and Abraham Facebook Page at Facebook.com/HupyandAbraham, click on the photo contest tab to upload your photos and then submit. Post your photo to Twitter or Instagram with the hashtag #HupyEats. The contest will continue to run through August 2017, with a final voting round in September. Finalists will compete for a “Best Summer Eats” Prize Pack from Hupy and Abraham! Photos receiving the most Facebook “likes” at the end of each month will receive a “Best Summer Eats” Prize Pack valued at over $100. The first and second runners-up will receive Hupy and Abraham, S.C. chef aprons. Photos receiving the most Facebook “likes” from each month (April, May, June, July, August) will go on to a final round in September 2017 to be eligible to win the grand prize worth over $2,500! Winners will be notified by email and announced on Facebook and other Hupy and Abraham social media pages. This contest is open to legal residents of Wisconsin, Illinois and Iowa. Automated or robotic votes submitted by individuals or organizations will be disqualified. Winners must accept a prize by email as directed within 15 days of notification. Enter today and remember to vote DAILY. May summer’s best-looking eats win!